This month CERN hosted its third Summer Student Webfest, a three-day caffeine-fuelled event at which participants worked in small teams to build innovative projects using open-source web technologies. 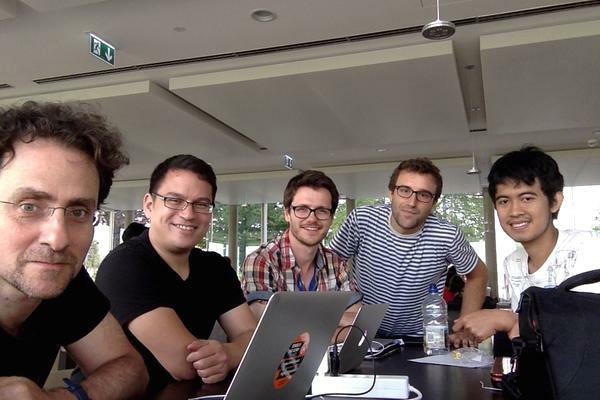 At last year’s event, a team of students, mentored by PyBossa’s principal developer Daniel Lombraña Gonzalez, developed the hugely successful CERN antimatter application on PyBossa-powered platform Crowdcrafting.org, a project which allows members of the public to contribute directly to CERN’s research on antimatter. The PyBossa team was again out in force to support this year’s event by mentoring teams and running workshops. Also in attendance was Cobi Smith and Fautso Cipolli of UNITAR-UNOSAT who coordinate GeotagX: a PyBossa-powered project which invites people to geo-reference photographs of areas affected by humanitarian disasters so that NGOs may better coordinate their response. Photo by James Doherty Alejandro and Marvin meet Ben Segal: 'grandfather of the internet' and inductee of the Internet Hall of Fame. The event opened with a session of three-minute pitches: participants with project ideas tried to recruit team members with particular skills, from software development and design expertise to acumen in physics. Projects crystallised, merged or floundered as 14 pitches resulted in the formation of eight teams. There were a host of projects to inspire the public to learn about CERN and particle physics, and others to encourage people to explore web-based solutions to humanitarian disasters with UNOSAT. The weekend was interspersed with mentor-led workshops introducing participants to web technologies. PyBossa developers Marvin Reimer and Alejandro Domínguez Bayo provided a guide to deploying a PyBossa server with Ubuntu Juju to create citizen science projects, and an introduction to building crowdsourced citizen science projects on crowdcrafting.org. The workshop finished with an online presentation from Alejandro Sanchez, coordinator of Cities at Night, a crowdcrafting-powered project which allows members of the public to analyse photographs of Earth taken by astronauts on the International Space Station. (Read more here). Photo by Alejandro Domínguez Bayo Alejandro Sanchez's view of the PyBossa crew. After three days of hard work and two largely sleepless nights, the eight teams were faced with the daunting task of presenting their projects to a panel of experts, with a trip to the Mozilla Festival in London up for grabs for one member of the overall winning team. The teams presented a remarkable range of applications built from scratch in under 48 hours. GeotagX and PyBossa took the prize for Best Design Project. Students Mary and Pedro worked tirelessly through the weekend to produce an easy-to-use template decision tree for NGOs using crowdcrafting.org to respond to humanitarian disasters. Cobi Smith commented that “we’ve been working together with the PyBossa team and several students… it’s been wonderful to have everyone face-to-face: we’ve really progressed the project”. Photo by James Doherty The winning GoetagX team with Francois Grey. 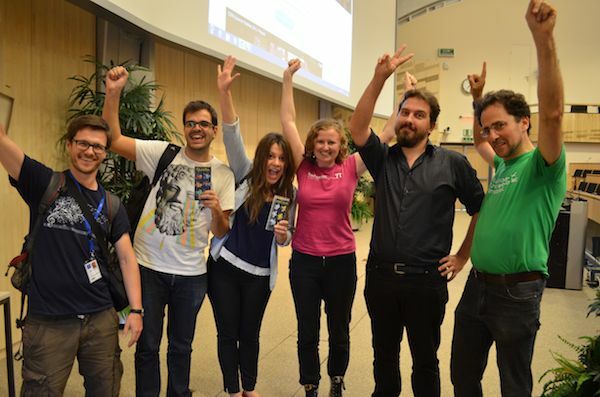 The CERN Summer Student Webfest was organised by François Grey, Ben Segal and SP Mohanty, and sponsored by the Citizen Cyberlab, Citizen Cyberscience Centre, Mozilla Foundation and The Port. Event mentors were from CERN, PyBossa and UNITAR/UNOSTAT. The judges were Antonella del Rosso (CERN Communications), Bilge Demirkoz (CERN Researcher) and Fons Rademakers (CTO of CERN Openlab).